In the early 1900s, FLBS founder Dr. Morton Elrod established Montana’s first weather station in his backyard in Missoula. FLBS has been collecting weather data ever since, with daily manual readings at our Yellow Bay location for the National Weather Service going back to 1938. In 2011, FLBS enhanced weather data collection and accessibility through the deployment of LakeNET, a telemetered network of environmental weather and water quality sensors. Weather sensors are mounted on land and buoy-based towers while water quality profilers are mounted below the buoys and travel from the bottom to near the surface of the lake multiple times each day. Data from LakeNET’s environmental sensors has greatly increased understanding of Flathead Lake’s biological and physical processes and is currently being used in concert with our long-term physical and chemical measurements to drive a nutrient-food web model for Flathead Lake. 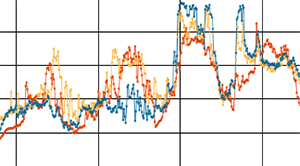 The National Weather Service routinely uses our data in their predictive models for Flathead Lake wind and wave conditions and their issuance of small craft advisories. FLBS weather data is updated every 15 minutes. Water conditions are updated every 3 hours. The FLBS Sensor Network is entirely supported by grants and donations. Please consider a donation to keep it free and available. * Precipitation since midnight; + Last 15 min. The Flathead Lake surface water temperature reading is measured at the end of Yellow Bay Point. 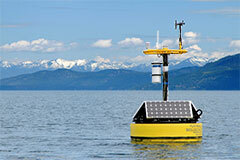 As one of the measurements in the Flathead Lake environmental data suite, temperature is reported every 15 minutes. Note that surface water temperature sensor readings are only available when the lake is at or near full pool (roughly May - September). The Flathead Lake water level value is provided by the US Geological Survey, whose gauging station is located on Salish Point near Polson, MT. Data is read in RDB format. Kerr Dam, at the lake outlet in Polson, regulates outflow to maintain Flathead Lake's level between 2,883 and 2,893 feet above sea level. If runoff conditions in the mountains don't warrant flood threats, the lake's level is brought to 2,890 feet by the end of May and to full pool by June 15. The National Weather Service uses FLBS LakeNET data in its Lake Surface Conditions Forecast and predictive issuances of small craft advisories.